The Legend of Shangri-La Cluster Pays slot (to use the full convoluted title) is full of Eastern promise in many ways as we will discover! Like Nextgen's Shangri La game it is based upon a mythical mountain valley from James Hilton's 'Lost Horizon' novel and if you combine that theme with Netent's other Cluster pays slot 'Aloha!' you pretty much have the idea here. The beautiful fantasy landscape makes our background along with gentle Oriental music when we play and our Wandering Fox stands on the left waiting to spread his wonders to the reels, so can you return from Shangri-La a richer player? We ditch the conventional paying lines here and have 6 reels of 5 rows each with stacked symbols, Wilds and scatters. To win you need 9 or more symbols in a block adjacently, i.e. no diagonals just left, right, above and below. 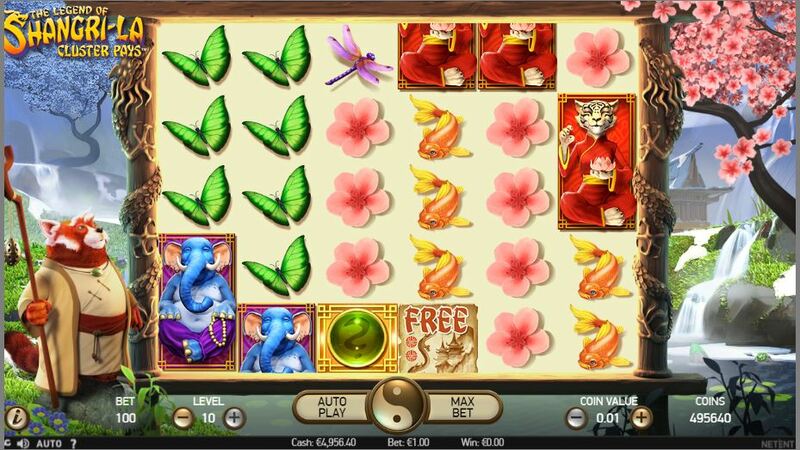 You pay 10 coins per play and pays are based on 9 to 30 symbols in a block and range from 1000x bet for all 30 Cats to 500x for all 30 Elephants and Monkeys. These icons don't appear fully-stacked 5-rows high like the rest and are called the 'Guru Symbols' appearing in pairs or singly. The remaining symbols all pay 200x for a full screen and are the Lotus Flower, Butterfly, Dragonfly and Goldfish. At the other extreme the minimum blocks of 9 pay 0.5x bet or 2x bet if Guru Symbols. You may believe prizes here in the Kunlun Mountains are difficult to come by but we have the Wandering Fox to help us! He will shake his stick sometimes to assist us by throwing mystery symbols onto the reels when 2 non-paying clusters occur and keep doing so until these Wilds make a winning block. If we see 2 scatters in the first 2-5 reels and on one of the other reels it is just above or below the grid, then like the Microgaming Untamed Giant Panda he may nudge it in for us! The best and is kept until last and when 2 non-winning clusters of 5 or more of the same icon appear he may freeze them and re-spin all remaining tiles individually until no more similar symbols appear, like the base game of Jack Hammer for example. There is no guarantee of a win but if the blocks join it's usually good. You will be awarded 5, 6 , 7 or 8 spins for 3 to 6 scatters and no retriggers. The Wandering Fox is in generous mood here as he will enhance the results from the first game onwards by adding 2 Wild tiles to the screen before we begin. After each spin he will add 2 to 6 more Wild tiles and after wins are paid the unwelcome Serpent will slide across and remove between 1 and 4 of them. If you are lucky you will build up large amounts of Sticky Wilds when the Serpent isn't too greedy. Should you end up with less than 10x bet for the round, you may be awarded one extra spin but that is rare - fortunately! 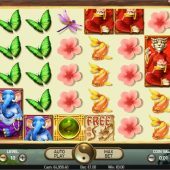 The Legend of Shangri-La Cluster Pays slot is an extremely entertaining game from our Swedish friends. It is far superior to Aloha! and has some great graphics and effects which also benefit from not being too juvenile, always a danger from Scandinavian developers. The RTP is a good 96.59% too with the random features occurring frequently and there is 1000x bet potential to tempt us into this valley. The volatility is on the high side of medium as a result but luckily you should get a few re-spin features to tide you over with wins in the 10-50x range while awaiting those free games. Why would I not want to visit this paradise on earth again?